Featuring the country's hottest comics, a night at the Jokesters Comedy Club will leave you in stitches! 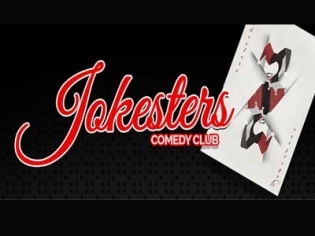 Big savings on Jokesters Comedy Club when you book online. Save 38%! Tickets for Jokesters Comedy Club start at just $25. Buy online today for the best deals. A 75-minute show featuring some of the funniest comedians who tour the country’s most famous comedy clubs and appear on national TV and late night programs. The hottest comedy club in Vegas is Downtown on Fremont Street inside the D Hotel. Jokesters has headliners from the comedy club circuit that continually rotate for a fresh lineup. Billed as a “Carnival of Fun,” Jokesters will give you a night of sidesplitting laughter. The acts change weekly so check the website and grab a ticket for your favorite comedian. Derek Richards, Anton Knight, Ryan Cole, Jason Harris and Brian McKim are just a few of the names you might want to check out. These guys are on top of the game and will have the audience roaring with laughter with their stand–up. Get ready to get down and dirty at the D with Jokesters, this show is not for the easily offended.